Ok, you're going to think this is the strangest cool technology blog to date. In my travels, I visit a large number restrooms throughout the world. Recently, I've noticed a significant rollout of "waterless" urinals. There must be some serious technology behind this, since no "input" plumbing is required at all. I often used the analogy that the paperless hospital is as likely as the paperless bathroom, until the Japanese introduced me to a paperless high-tech bathroom. Now we have the waterless bathroom. How does it work? 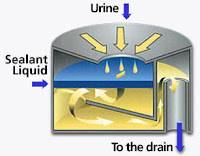 A special cartridge contains a lighter than water liquid that floats on top of urine, providing an airtight seal between the urinal and plumbing - no odor of urine or sewer gas enters the room. A typical office building can save millions of gallons of water every year by installing these units. No water supply is needed so the capital costs of installing them are less than standard fixtures. An environmentally sound, waterless urinal that uses the physical properties of fluids to create an airtight seal and eliminate odors, saving millions of gallons of water per year. That's cool! A few days ago, I was at a restaurant here in Boston (City Table on Boylston). They had one of these devices. They had a sign about it on the wall, too, letting us know not to expect water and just to accept the magic. Fascinated, I tried to observe just how this thing worked, going as far as to cup water from the sink and drop it in. After returning to the table, I launched into my excited discovery at the dinner table, barely able to contain myself. One by one, just about each person excused themselves to check it out. And each person returned excited by the news that these devices exist. I know these will be commonplace in a short amount of time, but they are very very cool. Thanks for this post - I've seen (and used!) these things and wondered how they worked They certainly seem to be effective! I love things that challenge "conventional wisdom" and all the assumptions that go into most product designs! They are pretty common in some areas of California where water shortages have been a problem for years. For example, the Naval Postgraduate School in Monterey used these pretty exclusively. This is related to the world's vanishing supply of phosphorus. The day will come when we may be obliged to recover that and other chemicals from human waste. “There’s a whole industry that needs to be invented to capture phosphorus,” Elser said. “We need a new way of growing crops that keeps it in the field instead of letting it run down into the Gulf of Mexico. We need plants that are more efficient at getting phosphorus. Ideally, researchers say, cities will become phosphorus “hotspots” of urine and feces that can fertilize the surrounding farmland. Sweden for example, plans to recycle 60 percent of its phosphorus back into agriculture by 2015. Two Swedish cities presently require all new toilets to separate urine for use on local farms. The nutrients in one person’s urine are believed to be sufficient to produce at least half and potentially all the food requirements for another person. Using collected human waste as a source of otherwise hard to obtain chemicals like phosphorus dates back at least to Nero’s “urine tax,” while alchemists in Europe routinely decanted urine to refine elemental phosphorus for their experiments. It's a wonderful device, but before installing the units you need to ensure that the drainage/outflow pipes are not made of copper. City Hall in Chicago used these units with the existing copper piping, which was then corroded through by the urinal outflow. This created quite a mess, as you can imagine. I've read they are installed in hospitals and are more hygienic. You can look them up on web www.waterless.com. Found out this company has been around since 1991.